The Cortijo Galvan cottage is located at only 60 kilometers away from the city of Malaga and 70 kilometers away from Granada, it is in the highway A-333 km 65, Archidona (Málaga) CP 29300, next to the Hotel La Bobadilla.There is paved access from the highway to the main buildings. Are you interested invited for a wedding at Cortijo Galvan and arriving at Malaga airport? The easiest way to get to our rural country house is by car. At Malaga airport you will find a number of reputable rent a car companies like Avis, Hertz, Sixt, Europcar and several local companies. The best thing to do is use a website from a broker like Hispacar which will help you to find the best car hire deal in Spain if you are not familiar with the rules and regulations in the car rental industry. Take the E-902/N 341 dual carriageway towards Antequera-Granada. 35/40 km out from Malaga, the dual carriageway splits into two: “Antequera-Sevilla” on the left, and “Granada” on the right. 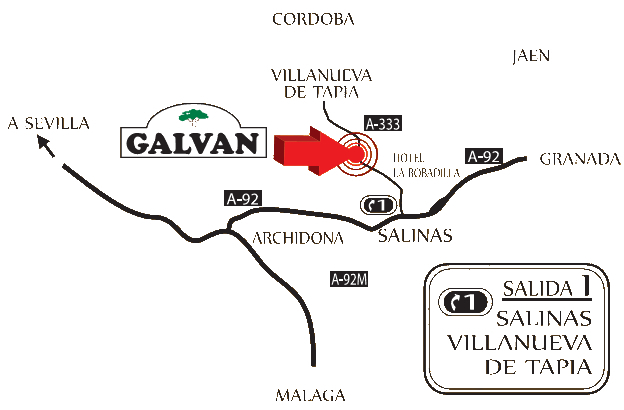 5 km from the exit, towards Iznajar/Villanueva de Tapia (A-333), right after the Hotel Barceló La Bobadilla, you will see on your right the main entrance to Cortijo Galvan. Road A-333 km 65, Archidona (Málaga) C.P 29300, by Hotel La Bobadilla.